The stormy weather continued across France during early June causing disruption to rail travellers. 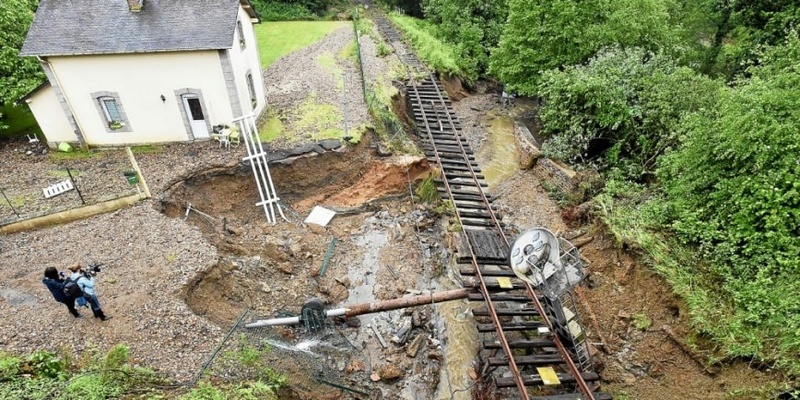 In Finistere a flash storm over Morlaix caused a mudslide washing away part of the Roscoff branch. A railcar stranded at Roscoff, was subsequently removed by crane and road vehicle. The future of the line is now unclear. (Photos Claude Prigent). 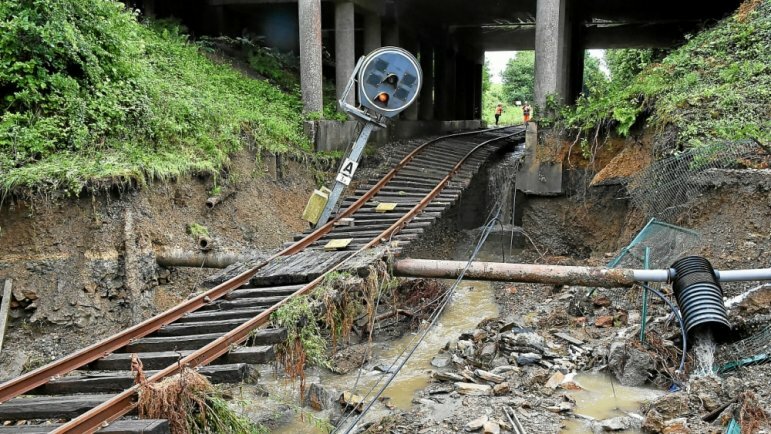 Storms over Paris in the early hours of the 12th June caused an overflow of water from a retention pond near Courcelles-sur-Yvette on RER Line B, sweeping away the ballast under 3 m of track. The first train from the southern terminius at St Rémy-les-Chevreuse departed towards Paris with two drivers on board, in anticipation of trees and branches on the line. After the first stop, the train partially derailed The front motor carriage passed, but the 2nd, 3rd and 4th carriages derailed and turned on their sides (bottom photo opposite). They were blocked by trees and catenary poles from slipping further. Fortunately only seven passengers were slightly injured. New Bombardier Z 57000 double deck units begin services on Paris - Moret - Montereau (Transilien Line R). A blue carpet welcome was extended to the inaugural REGIO 2N train from Melun on its arrival at Paris-Gare de Lyon platform M with Valerie Pecresse, President of Ile-de-France Region on board. Sixteen Z 57000 train sets have entered service since December 2017. They have now replaced all the Z 5300 units on Melun - Héricy - Montereau. After three months of strikes for two days every five where are we? On the 14th June the Senat adopted the Government's railway reform legislation, it having been approved by the Assemblée Nationale the previous day. The legislation does three things. It converts the SNCF Group from it's current state organisation status into a state owned company giving the management greater corporate flexibility. The government will take on €35 billion of the Group's debt to make the financial position managable. SNCF's current monopoly of domestic passenger services will be phased out on core routes from 2020 with the introduction of open access and on TER contracts from 2023, to make France compliant with EU legislation on competition. Staff joining the railway industry on or after 1st January 2020 will not have the cherished 'cheminot' status but will be subject to revised terms and conditions. 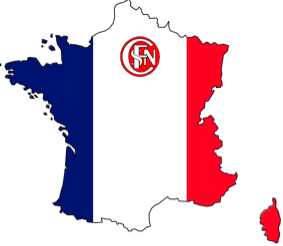 The more moderate unions (UNSA + CFDT) proposed amendments resulting in concessions, particularly where SNCF staff are transferred to new operators with the option to transfer back to SNCF in a similar role within up to eight years; more generous than normal EU TUPE conditions. While the strikes have been weakening there has still been considerable disruption on strike days, even after nearly three months. 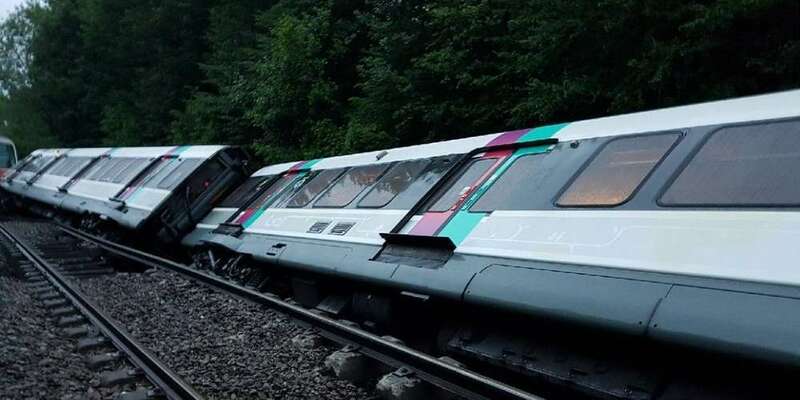 For Sunday 17th June SNCF reported that it was operating 66% of Transilien services, 60% of TER services, 75% of TGVs and 50% of Intercités services. SNCF have concentrated available staff on the busier routes with rural areas bereft of any services even on non-strike days. Services on strike days between Amiens and Boulogne did not commence until June, but there was little thought about making the best use of available resources. Northbound services consisted of the 07:13 Amiens - Boulogne TER followed 90 minutes later by the 07:31 Paris - Boulogne, the stock (AGCs) was then used to form the 09:45 and 12:45 Boulogne - Paris services that make limited stops. This meant that stations like Noyelles and Rue had a northbound service but nothing going south. The more practical problem was that apart from some TGV services that are pre-bookable in advance SNCF did not announce which services were operating until 17:00 on the day before. On the evening of Saturday 16th June the Hauts de France website was reporting technical problems and no details of the following days services were available. A visit to Noyelles Sur Mer station found amended timetables pasted onto the entrance doors, but as you approached them the automatic doors disappeared into a recess and only emerged if you stood too far back to read the amended timetable! Where does this leave us? The programme of intermittent 2 day strikes continued until June 28th the last planned day of action with all the unions. From the Government's perspective it has achieved its objectives. With liberalisation of domestic passenger services on the horizon, SNCF will be re-structured, the debt issue will be more manageable from 2020, and staff working practices will be re-negotiated to improve productivity and competitiveness in the long term. The controversial Spinetta proposal for a systematic review of rural lines has been parked, but not forgotten ! For SNCF they have to deal with the aftermath of 36 days of strikes that were estimated to have cost 400 million euros. During the strike the government announced a package to try and make SNCF Fret profitable, but customer confidence will have been dented in this fragile sector, and passengers will have found other alternatives. It is impossible to forecast whether industrial action is finished or merely suspended. UNSA and CFDT the second and third largest unions have decided not to proceed with any more strikes over the summer. Members of these two unions are principally administrative staff and management. The largest rail union, CGT, has decided to continue with strike action. This union has its strongest support among drivers, guards and signalling staff. CGT (with SUD Rail) has called its members to strike on July 6th and 7th. SUD Rail is a small union that is very extreme and it is represented among drivers especially in the Paris region. No dates for strike action beyond July 7th have been announced as of the end of June. On the 10th June Pays de la Loire Region introduced Bombardier Regio 2N V200 trains on the Orléans to Nantes/Le Croisic serives. The 200km/h units are the long term replacements for the Class 26000 Sybics withdrawn last year. Each train can carry 501 passengers and nine bikes, although the modular design enables this to be increased to 50 bikes if required. A total of thirteen units have been ordered, three will be deployed on 'Interloire' services and the others on periurban services around Nantes where their capacity will help reduce overcrowding. SNCF's open access freight operator, VFLI, has placed an order for 12 Stadler (formerly Vossloh) E4001 diesel-electric locomotives and agreed to purchase the prototype Euro-dual bi-mode locomotive. Based on the E4000 design but meeting the more stringent IIIb emissions standards, the E4001 Co-Co delivers 2,800 Kw. The locos will be fitted with ECTS for operation in France and Belgium. Delivery is expected in 2020. Following the derailent on the 12th June (see above) things got worse on the following day when a signalling switch at St Lazare, dating from 1966, developed a short circuit closing the station for 10 hours, and RER Line A was cut at Auber due to a broken rail. Île-de-France Mobilités has released more details of an order for 255 double deck RER NG's (Nouvelle Génération) They will be jointly produced by Alstom and Bombardier - latest official artist impression above) for use on RER line D (125 trains) and RER E(130 trains). 71 NG units will be delivered to RER D in 2021. The trains for RER E will be delivered for the extension to Nanterre expected in 2022 and Mantes-la-Jolie in 2024.The remaining 54 trains for RER D will be delivered by 2025 to complete replacement of the present fleet. The order is part of the plan to replace or renovate over 700 trains between 2016 and 2021. Regio 2Ns will operate lines R, D(Malesherbes branch) and N. Francilien units will operate Lines H, J, K, L and P while Lines A, B, C and U are in the process of receiving renovated units. Visuel Alstom. The Paris tramway T3b is being extended 4km from Porte de la Chapelle to Porte d'Asnières. The extension is due to be opened on Nov 24th 2018 although in June, track laying along the final few hundred mètres had not yet been completed. Tram-train T4 between Bondy and Aulnay will be closed for two months from July 6th in order to test the fleet of 15 new Alstom bi-voltage Dualis IDF trams which will replace the Siemens Avanto units which are to be refurbished and modified. A new branch of 6 km under construction from Gargan to Montfermeil will be opened in June 2019. For technical reasons the junction at Gargan must be electrified at 750v DC though the Bondy - Aulnay line is electrified at 25kv AC. The Avanto units must be prepared for this voltage switch on a short stretch. The new branch from Gargan will be electrified at 750v DC. T4 is operated by SNCF. All the tram-trains are stabled at Noisy-le-Sec together with those on T11. Closed since April 16th for refurbishment, this line is scheduled to re-open on 1st September. The major area of work has been the Colroy Tunnel that has included the replacement of 1,650 metres of track and ballast that was last renewed in 1946, elsewhere 9,000 sleepers dating from 1927-1946 have been replaced and the track has been lifted and profiled to restore the line's normal speed limit. The €13m project has been 85% funded by Grand Est Region. Speed restrictions of 60kph have been introduced a reduction from the normal line speed of 140 kph. An estimate of 94 million euros to modernise the line. No finance package completed yet. Buses were substituted on the Saillat-Chassenan - Angouleme section ealier this year following storm damage. The emergency timetable finishes on the 6th July, but the new timetable operating until December continues the use of buses over this section. Local mayors staged demonstrations during June to demand the return of trains but there was no response. This secondary single track line in Brittany links Dinan (an important tourist centre) with Dol and St-Brieuc via Lamballe. It is 69 km long and mostly in poor condition with speed restrictions. There are 7 return services daily between Dinan and Dol where there are connections to St-Malo and Rennes. On June 4th, agreement was reached to finance the repairs and renewals needed on a section of 18 km (Pleudihen - Dol) plus the viaduct at Dinan. Work will start in 2020 (Budget 26 million euros). Between Dinan and Lamballe (40 km) the line is subject to 60 kph speed limits since 2017and the rail service is reduced from 5 to 3 trains a day each way. At the June 4th meeting, it was agreed to finance the studies to define the details and cost of engineering work required. Meanwhile it was agreed to accelerate maintenance to keep the minimum service in place until the line can be regenerated. However the mix of slow trains and buses has already decreased utilisation by 25% according to the local user association. Work has begun on the complete re-building of the line with operating bases at Gamaches, Feuquières and Grandvilliers. The old infrastrucutre will be removed as passing loops, sidings, and Nord signalling are still in place although unused this century. The line will be completely rebuilt with new track and signalling and the road crossings replaced and is scheduled to re-open in December 2019. The €71.3 million project is funded €50.5 million by Hauts de France Region, €15 million by Normandy Region (where most of the line actually lies) and the balance by SNCF Reseau. The rail service is suspended on this line due to faulty track near Pompadour. - Museon di Rodo Scrapbooks - the entire collection of drawings contained in the series of 73 Scrapbooks has been uploaded, giving a wealth of information on mostly French but also foreign railways. These documents were originally published in the 1970’s by the Museon di Rodo based at Uzes (Gard), long since closed. - An Index is available on the FRS Yahoo site. 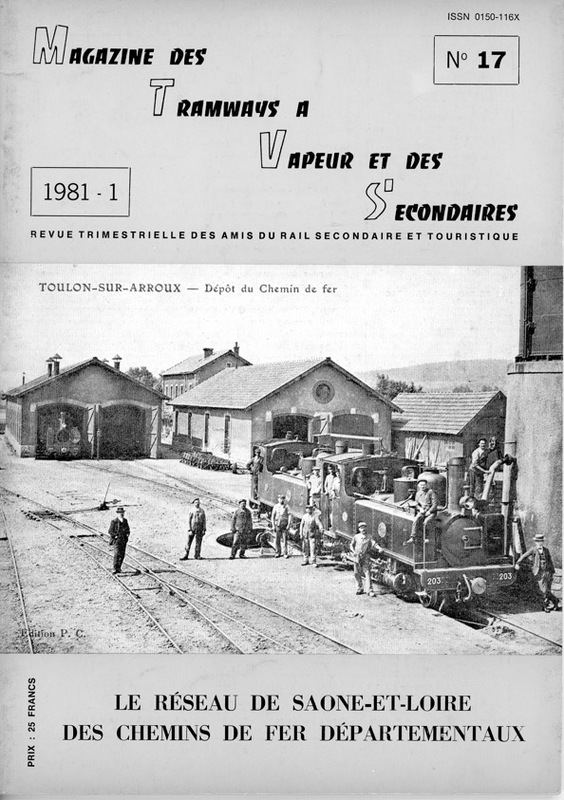 - MTVS issues - these are copies of the magazine, now out of print, dealing largely with secondary railways in France. The latest issues uploaded are No. 14 “Les CdF du Sud-Ouest”, No. 16 “CFD Seine & Marne“, No. 17 “CFD Saone & Loire“, No. 18 “CFD Indre & Loire“, No. 19 “CFD 1881 - 1981“, No. 21 “Automotrices Tartary & Dion Bouton“ and No. 22”Tramways de l’Ardeche“. On Thursday June 14th, 141 R 1126 undertook another test run between Saint Jory (its present base) and Cahors. The objective was to see if all was well after the work carried out last winter on the "tête de bielle" which had ran hot during the previous test run in November 2017 at Castelnaudry. This time the route chosen was a little longer (100 km instead of 70 km) and more difficult with gradients of 10 per 1000. Outbound, BB 7338 was at the front double heading the train with 141 R 1126 tender first. There were four stops and after the last one, the uphill gradient to reach Cahors where there was a water stop. On the return trip, the steam engine hauled the train alone and non stop from Cahors to Montaubon. There were no apparent incidents and 1126 is expected to haul its first excursion (after the lengthy overhaul) in August from Toulouse to Cahors (subject to authorisations and absence of strikes ). So far this year all trips have been cancelled due to the absence of the steam engine. 141 TB 424 sustained a problem during preparation at Longueville in April. That has been resolved and the locomotive is now expected to be moved to Brittany over the 4-6th July. Due to the strikes steam engine movements have been the last priority. In March and May we reported planned special trains to Le Lioran, Cantal for the week end on July 28th/29th to join the festival at the top of the pass to celebrate 150 years anniversary of the railway. The rail strike and technical problems have produced a cascade of cancellations. AAATV Montluçon have cancelled. X 2403 is apparently not in service. The planned visit of Picasso X 4039 from Dijon is unlikely due to the effects of the strike, the trip has not been opened for reservations as of the end of June. There will be no special train from Clermont Ferrand organised by the Train à Vapeur d'Auvergne. We are left with three special trains; The AP 2800 train from Langogne on Saturday, The diesel hauled special train from Toulouse also on Saturday and the Autorail-LImousin train on a circuit around the Massif Central that will pass by on Sunday. From a major event envisaged 6 months ago, this has become a minor moment due to circumstances outside the control of the organisers. The weekend of the 9th/10th June saw the CFBS formally celebrate the complete re-building of the Le Crotoy - Noyelles section of the Baie de Somme network. The official re-opening ceremony took place on the morning of the 9th June with the various civic dignatories and representaives of the Somme Department who had funded the €1.3 million rebuilding of the line. At Morlay a passing loop has been installed and the station hes now become a regular stop with platforms and information boards erected (see above). An extensive service operated on both days with eleven services each way, most passing at Morlay. On May 12th/13th, AMITRAM celebrated 50 years of preserving old trams and buses on a site at Marquette in the northern suburbs of LILLE. The association operates a short line along the bank of the river Deule. The track is metre gauge, electrified at 600 volts. Preserved items include numerous local trams and buses and some Swiss and German trams. The two principal preserved trams (420 + 432), operated on the museum line, were originally built for ELRT (L'Electrique Lille Roubaix Tourcoing). This interurban tramway opened in 1909 and was also known as the "Mongy" after the engineer who created the network. The tramway is still in service. The class "400" trams (built by Franco-Belge company) were very modern for their époque, with bogies, electric lighting. and heating, larges windows, enclosed driving cabins. Capacity was 100 and top speed was 58 kph. 35 tramcars of this type were built between 1909 and 1926. They were retired in the early 1950's. 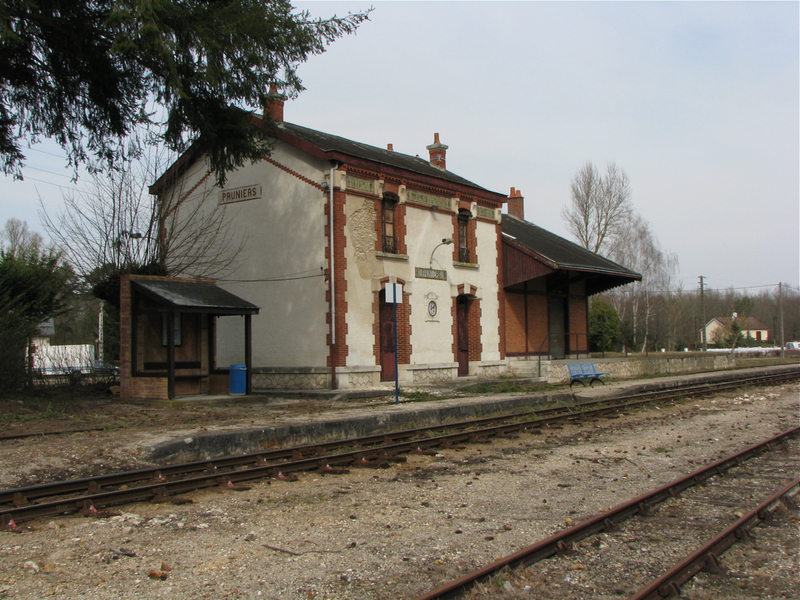 Local councils have financed repairs to the Blanc - Argent line between Luçay-le-Mâle and Valençay (10 km). Le Train du Bas Berry association which is based at Ecueillé (Indre) operates tourist trains on Sundays and now has access to the station at Luçay which is no longer served by TER Centre trains. 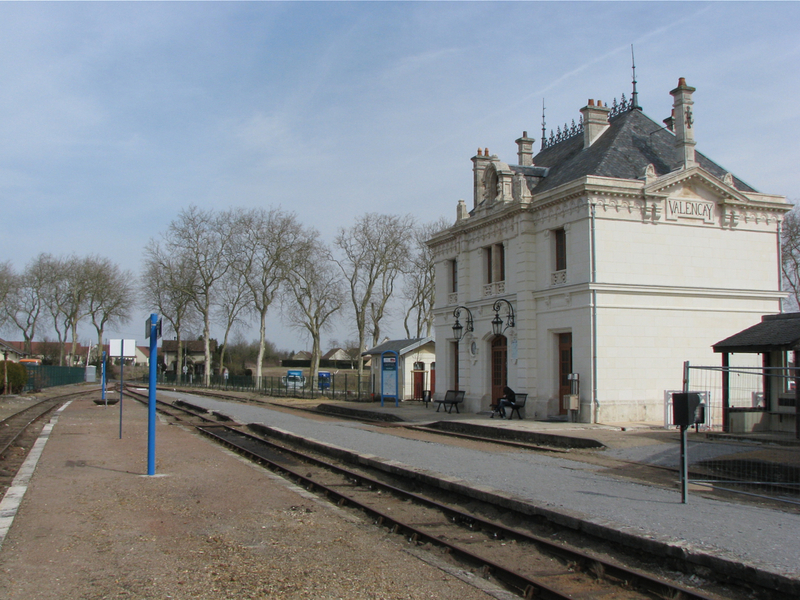 Valençay station in order to accept the tourist train from Ecuillé. So plans for a Bas Berry train at Valençay on Sundays are suspended at present. 4 TER Centre trains reach Valençay on Sundays from Romorantin and Salbris. As shown in the 2010 photo there are 3 tracks available. The station building at Pruniers (opposite) was empty for years and deteriorating. It has been purchased and renovated by a local couple who work on the railway. But the pine tree had to go. The organisers of the annual "1900" festival at Soulac-sur-Mer in the Gironde once again chartered a train with 140 C 38 + historic carriages for an excursion Bordeaux St Jean - Soulac-sur-Mer and Verdun on June 2nd. Although there was a national rail strike, this private train operated successfully thanks to some strong local political pressure on SNCF. The train being a charter it was not mentioned on the website of the association. Passengers in 1900 dress joined the train at Bordeaux where it had arrived the previous day from Limoges. Due to the absence of a turntable at the end of the branch line, BB 67615 was marshalled at the end of the train which was headed outbound by the steam engine. For the return the following day the 140C was tucked in tender first behind the blue diesel. Opposite are links to two videos of the trip to the seaside. Observe the two Nord carriages recently restored. Photo at Négrondes, by J.L.Poggi. Billard double railcar A 150 D2 No 222 returns to service at VFV. On June 9th, VFV (Velay Express) at Raucoules, Haute Loire operated a special inaugural train to Saint Agrève with Billard No 222 equipped with new hydraulic controls. On board were some of the generous donors who had raised 22,000 euros last year to finance the modifications. No 222 was delivered to the CFD Vivarais in 1939. It is the only surviving railcar of the type, articulated on 3 bogies with a centrally mounted motor and 56 seats. After closure of the Vivarais railway in 1968, No 222 was preserved at Saint Agrève and later was classified Monument Historique. From 1998, it has been operated by VFV and has received several overhauls.It has been out of service since 2012 due to problems with the gearbox controls. The attached photo taken by Jean-Marc Frybourg shows the newly painted double railcar on the VFV line in June 2018. This month, we will describe the latest preservation developments regarding two steam trams that are among the oldest survivors of their type. We refer to the Sarthe Tram No 60 (1898) preserved by MTVS at Butry-sur-Oise and Crèvecoeur-le-Grand, and the vicinal tram HL 303 (1888) preserved by ASVi at Thuin, Belgium. These two historic steam locomotives are linked in several ways. Both were constructed by the same enterprise; Ateliers Metallurgique de Tubize in Belgium for 303 and its French subsidiary A.N.F. at Blanc Misseron in the north of France for No 60. At the end of the 19th century, steam engines for urban and roadside lines had to be 'disguised' to avoid scaring horses and other road users. So steam trams concealed their wheels and coupling rods behind metal doors that could be lifted up for access. These were called skirts ("jupes"). An overall roof covered the engine and its chimney and, to facilitate driving, these steam trams could be operated from either end. They were "bi-cabine". Firing was only possible at one end, of course. The Sarthe tram was an exception to this rule and was only provided with controls at the firebox end, since it was used only outside the towns. TS No 60 is in service at MTVS and, excitingly, HL 303 is under reconstruction in France and will soon steam at ASVi for the first time in 60 years. These two associations are officially "twinned" together since 2017. Let us investigate further. The small kingdom of Belgium was once covered with a dense network of roadside and urban light rail lines and tramways, with electric, steam and diesel traction. This was the "Belgian Vicinal". HL 303 was the third in a class of 68 steam trams known as type 7. They were 0-6-0 bi-cabine engines that weighed 25 tons. 303 was delivered in 1888 to Liège in Wallonie where it was operated for 70 years until 1958. After a short period on a coal mine network, 303 was retired and transferred to the Belgian national tram museum at Schepdael in 1965 and then to ASVi at Thuin in 1992. 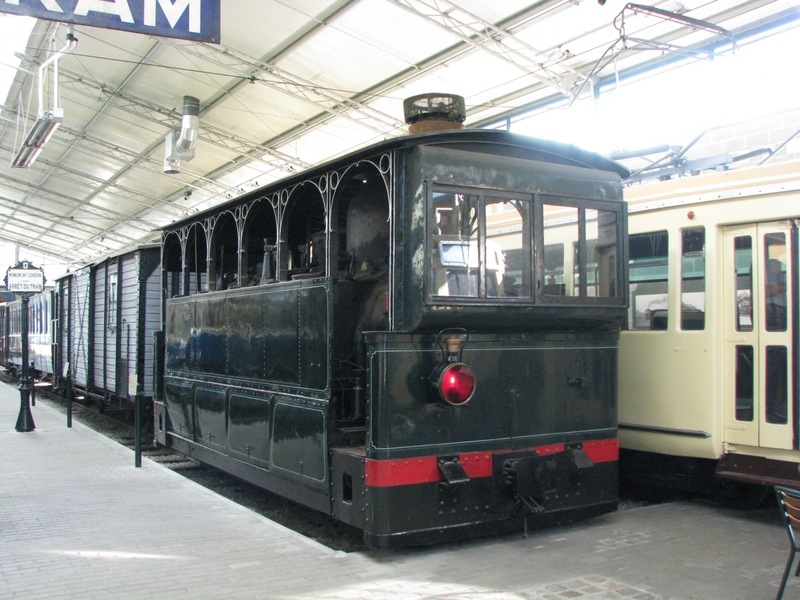 ASVi is a leading centre in Belgium for the preservation of vicinal trams. The museum has more than 50 historic vehicles (electric trams, trailers, diesel railcars, wagons) and 3 running lines, 2 of which are electrified. HL 303 was displayed in the new museum from 1999. It is the oldest vicinal steam engine in preservation. In 2015, ASVi transferred 303 to CITEV at Saint Jean du Gard in the Cevennes. The Belgian tram was to be reconstructed there in order to operate in steam again. A new boiler has been built, identical to the original. In 2018, HL 303 is being re-assembled at Saint Jean after repair and/or replacement of all the components. On May 17th, the new boiler received its certificate ("timbre"). It is expected that 303 will return to Thuin later this year to steam again regularly with a rake of historic vehicles specially prepared. This will be the first steam operation at the Thuin museum. For info, Thuin is a 30 minute drive from the centre of Maubeuge (F). It can be reached by train from Charleroi (B). In June 1976, two rusty old engines were found in a wood near Champagne a few kilomètres from Le Mans in the Sarthe. These were identified as unique historic steam trams. They had been sold along with others to a local scrap metal dealer in 1949. All the others trams had been demolished but No 16 and No 60 had been set aside in the wood and could be preserved 27 years later. 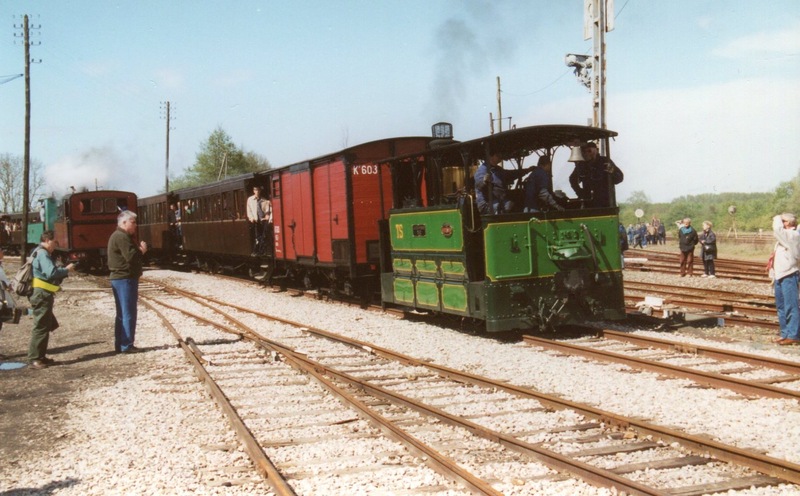 The two steam trams formed the basis of a new rail preservation association; MTVS at Butry-sur-Oise in the summer of 1976. The two 0-3-0T type tramway locos discovered had originally been built in 1897/1898 by A.N.F Blanc Misseron for the Tramway de Sarthe, a vast network of urban and suburban roadside lines totalling 416 km. Altogether, A.N.F built 22 of these steam trams for the Sarthe lines. Each tram was given the name of a village on the network. No 16 was named "St Denis d'Orques" and No 60 was named "La Ferté Bernard". In 1983 No 60 became the first railway vehicle to be classified "Monument Historique" by the Ministry of Culture. No 60 was renovated and received a new boiler. It steamed again from 1990. In 2003, No 60 visited the CFBS lines for the Steam Festival in April (photo). Between 2009 and 2016, TS No 60 was given another overhaul and returned to service in October 2016. In May 2018, the Sarthe tram made its first international visit, to the Swiss Blonay-Chamby museum as reported last month. After the Blonay-Chamby 50th anniversary event, No 60 travelled on its low loader directly to Crèvecoeur-le-Grand, Oise where it operates the Sunday trains this year. For info: Crèvecoeur-le-Grand is 12 km from Beauvais airport (RYANAIR) and 9 km from the A16 motorway (exit 16). © Peter Lovell & Graham Skinner. The French Railways Society 2018. Photos by authors unless credited. Thanks to D Michel Costes, Jean-Louis Poggi, Georges Turpin, Didier Delattre, Eric Martin & Jean-Marc Frybourg.